Circumferential (encircling) burns of the trunk are generally unsuited for exposure because all of the burned surfaces cannot be adequately exposed to the air at one time. Granulating surfaces should never be exposed. Sabiston:- First-degree burns are, by definition, injuries confined to the epidermis. These burns are painful and erythematous, blanch to the touch, and have an intact epidermal barrier. Examples include sunburn or a minor scald from a kitchen accident. First-degree burns do not result in scarring, and treatment is aimed at comfort with the use of topical soothing salves, with or without aloe, and oral nonsteroidal anti-inflammatory agents. Third-degree burns are full thickness through the epidermis and dermis and are characterized by a hard, leathery eschar that is painless and black, white, or cherry red. No epidermal or dermal appendages remain; thus, these wounds must heal by re-epithelialization from the wound edges. Deep dermal and full-thickness burns require excision with skin grafting to heal the wounds in timely fashion. Fourth-degree burns involve other organs beneath the skin, such as muscle, bone, and brain. Because full-thickness grafts are impractical for most burn wounds, split-thickness sheet autografts harvested with a power dermatome make the most durable wound coverings and have a decent cosmetic appearance. Schwartz:- Thighs make convenient anatomic donor sites, which are easily harvested and relatively hidden from an aesthetic standpoint. The thicker skin of the back is useful in older patients, who have thinner skin elsewhere and may have difficulty healing donor sites. The buttocks are an excellent donor site in infants and toddlers. The scalp is also an excellent donor site; the skin is thick and there are many hair follicles so it heals quickly. It has the added advantage of being completely hidden once hair regrows. Areas of cosmetic importance such as the face, neck, and hands should be grafted with nonmeshed sheet grafts to ensure optimal appearance. Hence superficial burns include first degree as well as second degree superficial ones with superficial dermis involvement. c)Half of the calculated fluid given in initial 8 hrs. d)Diuretics should be given to all pt of electric burn. Bailey:- Fluid resuscitation:- It is important at an early stage to secure large-bore intra­venous lines. Samples are taken for haemoglobin, urea and electrolytes, and blood cross-matching. Blood gases and blood analysis for carbon monoxide or cyanide poisoning are required in the unconscious patient. Having estimated the percentage burned surface area and measured the body weight, initial fluid resuscitation can be planned. The simplest formula (for adults) is: 3—4 ml/kg body weight/% burn/in the first 24 hours.Half of this volume is given in the first 8 hours and the rest in the next 16 hours. Timings begin from the time of the burn, not the start of resuscitation. Hartmann solution is preferred, but other isotonic fluids may be used. Metabolic fluid requirements are also needed. Formulae are only a guide and the adequacy of fluid resuscitation is monitored by regular clinical assessment. A urinary catheter is essential. Urine output is the best guide to adequate tissue perfusion; in an adult one should aim for 30—50 ml/hour. Schwartz:- As in any critically ill patient, the target MAP is 60 mmHg to ensure optimal end-organ perfusion. Goals for urine output should be 30 mL/h in adults and 1 to 1.5 mL/kg per hour in pediatric patients. Because blood pressure and urine output may not correlate perfectly with true tissue perfusion, the search continues for other adjunctive parameters that may more accurately reflect adequate resuscitation. Some centers have found serum lactate to be a better predictor of mortality in severe burns; others have found that base deficit may be a better predictor of eventual organ dysfunction and mortality. Burned patients with normal blood pressures and serum lactate levels may still have compromised gastric mucosal blood flow. However, continuous measurement of gastric mucosal pH is logistically difficult and has not been widely implemented. A myriad of formulas exist for calculating fluid needs during burn resuscitation, suggesting that no one formula benefits all patients. The most commonly used formula, the Parkland or Baxter formula, consists of 3 to 4 mL/kg per percent burned of lactated Ringer’s, of which half is given during the first 8 hours postburn, and the remaining half over the subsequent 16 hours. The concept behind the continuous fluid needs are simple. The burn (and/or inhalation injury) drives an inflammatory response that leads to capillary leak; as the plasma leaks into the extravascular space, crystalloid administration maintains the intravascular volume. Therefore, if a patient receives a large fluid bolus in a prehospital setting or emergency department, that fluid has likely leaked into the interstitium and the patient will still require ongoing burn resuscitation, according to the estimates. * Estimates are made, recorded, and then summed to gain an accurate estimate of the body surface area burned. Schwartz has made the Rule of 9 depiction wrong by giving front and back of lower limb 18% each while its only 9% only. Determination of burn size estimates the extent of injury. Burn size is generally assessed by the so-called rule of nines .In adults, each upper extremity and the head and neck are 9% of TBSA, the lower extremities and the anterior and posterior aspects of the trunk are 18% each, and the perineum and genitalia are assumed to be 1% of TBSA. 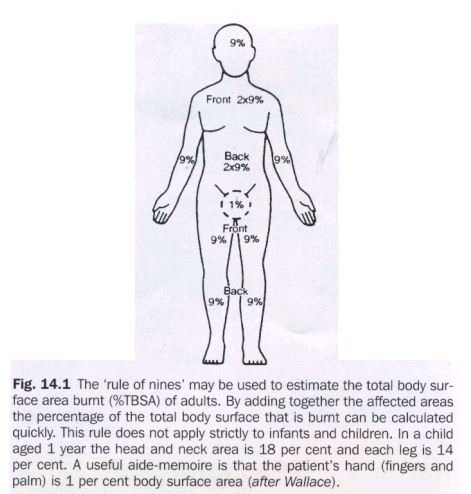 Another method of estimating smaller burns is to consider the area of the open hand (including the palm and extended fingers) of the patient to be approximately 1% of TBSA and then transpose that measurement visually onto the wound for a determination of its size. This method is helpful when evaluating splash burns and other burns of mixed distribution. 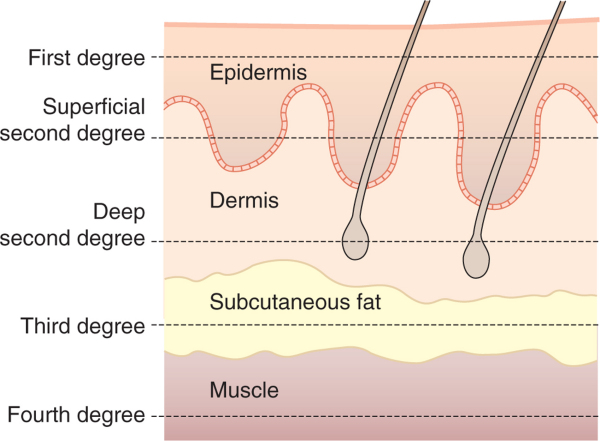 An approximate clinical rule in wide use is the ‘rule of nines’ which acts as a rough guide to body surface area (Fig. 14.1). The examining doctor should assess the total area involved and how much of the area is partial thickness and how much full thickness. As a general rule, an adult with more than 20 per cent of the body surface involved or a child with more than 10 per cent of body surface area involved will require intravenous fluid replacement. However, an intravenous access line may be necessary for adequate analgesia for much smaller areas of burn and many children in particular will require fluid replacement because of vomiting. For smaller percentages than the above, it is necessary to maintain an adequate oral intake of fluid. The prognosis depends upon the percentage body surface area burned. A rough guide is that if the age and percentage add together to a score of 100 then the burn is likely to be fatal. A child may therefore survive a large burn, but even a small burn in an elderly patient is potentially fatal. This entry was posted on May 30, 2011 at 11:43 pm	and is filed under Medical. Tagged: AIPGMEE MCQs, All india MD/MS entrance exams MCQs, All india MD/MS exams MCQs, Burn MCQs, Medical MCQs, Multiple choice questions, pg mcqs, PGMEE MCQs, Surgery MCQs. You can follow any responses to this entry through the RSS 2.0 feed. You can leave a response, or trackback from your own site. I found it to be very interesting! Thank you for posting such a nice question with its summary!! A very well compiled mcq site on all topics. The layout is nice and clean with lots of options. Thnx a lot to all of you…i mean that concerned team. Thanx for posting such a Post.very helpful.